Founded in 1948 by Edward P. Roski, Majestic Realty Co. is the largest, privately-held developer and owner of master-planned business parks in the United States. 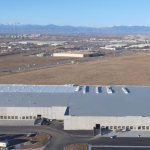 The Majestic Commercenter was established in 1996, as a 1,500-acre, master-planned business park in Aurora, Colorado. As a portfolio developer, Commerce Construction and Majestic Realty build-out and manage the business park. We furnished and installed complete TPO roofing system and skylights on 3 buildings. Installation includes R30 polyisocyanurate; mechanically attached TPO, 24-GA prefinished steel roofing related sheet metal flashings; skylight installation included cutting deck, wood blocking, curb and lens installation.